Questprobe is a trilogy of graphical adventure computer games featuring Marvel Comics characters. The three games are Questprobe featuring The Hulk, Questprobe featuring Spider-Man and Questprobe featuring The Human Torch and The Thing. The games were designed by Scott Adams, developed and published by Adventure International and the first was originally released in 1984 for the Atari 800, Apple II, ZX Spectrum, Commodore 16 and Commodore 64 with the sequels being published each following year. The original plan was for a series of twelve games, but Adventure International's bankruptcy in 1985 brought a rapid and premature end to the line. The manual of Questprobe featuring the Hulk credits John Romita Sr., Mark Gruenwald and Kem McNair with creating the art, however it is not clear if this is the in-game art, or the artwork in the manual. The manual feature images so detailed they could have been pulled directly out of the comics. After this first title in the series, Scott Adams did a major upgrade to his adventure game engine. Because of this, Questprobe featuring The Hulk was much rougher than the subsequent titles in the series. It could only handle two word directions at a time and understood very few terms. 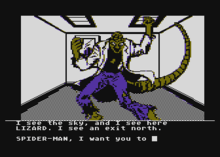 The second Questprobe adventure which featured Spiderman improved on the 'verb noun' command interface of The Hulk and allowed fuller sentence inputs. The title also incorporated improved graphics. In addition, a compilation entitled Adventure Series 13+ was released by Tex-Comp in 1984 for the TI-99/4A. The fourth title in the series was to include the X-Men - this game was partly coded by Scott Adams but never saw the light of day as a published game, as Adventure International became bankrupt during its development in 1985. The partially coded game can be found around the internet and on many fan sites. 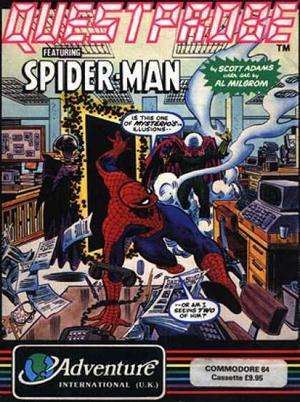 A Questprobe comic book tie-in was also released. Originally intended as a 12-issue limited series, this series was canceled after issue #3 (November 1985) due to Adventure International's bankruptcy. The story intended for issue #4, featuring the X-Men, was published in Marvel Fanfare #33 (July 1987). The events of the Questprobe comic book were later followed up on in the Quasar series. ↑ "Scott Adams Questprobe series". Retrieved 12 August 2012.